I've written about coming late to the Chicago White Sox as a fan. I'm certain that if in an alternate reality I'd been born in Illinois in the early 1990s and raised a Sox fan I'd be a huge, gushing admirer of Paul Konerko. As a kid, I gravitated to players who weren't superstars; I loved Freddy Lynn, Pete Rose, and Reggie Jackson, but my heroes were Graig Nettles, Ken Singleton, and Ruppert Jones, guys who played baseball really well—even as a kid I knew how hard the game was—but in the shadows of the giants. 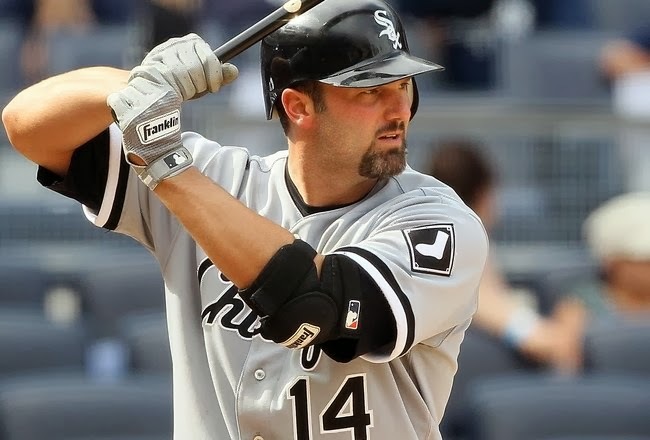 Konerko is such a player, and I've loved him ever since he was traded to the White Sox before the 1999 season. He'll turn 38 in March, and he's retiring after this season and 16 popular years on the South Side. I'll miss watching him day to day. Konerko's lifetime stats don't overwhelm, aren't catnip to Hall Of Fame voters and debaters, but they reflect a sturdy, productive career in the major leagues. To date: a career OPS of .847. 434 homers. 1,390 RBI. 2,297 hits. 911 walks to 1,340 strikeouts. .281 batting average. Thick-legged and notoriously slow, Konerko's legged out eight triples in his career, so few that I remember several of them vividly! He's stolen only nine bases, surely half of them when the pitcher was otherwise distracted. He's averaged over 600 plate appearances per season, and has often played hurt. He's appeared in three post-seasons for the Sox, including the 2005 World Series, in which the Sox swept the Houston Astros. He's been a solid, dependable presence for managers Jerry Manuel, Ozzie Guillen, and Robin Ventura (with whom he missed being a teammate by a season, in the late 90s). Much has been made, in the Chicago media especially, of Konerko's quiet temperament, too quiet, many feel, for the captain of the team, an honor which Konerko didn't court but accepted with maturity. A quiet ballplayer never bothers me; as fun as players with over sized personalities are, I'd rather a team field nine dependable, taciturn players than nine loudmouths who pop up or strike out more than they should. Konerko is a flawed player—he's too slow, grounds into too many double-plays, and has little range at first base—but in his prime his bat speed against fastballs was astonishing, and exciting. I've taken him for granted. Two Konerko plate appearances stand out for me in memory. In the second game of the 2005 World Series, Konerko came to plate in the seventh inning with the bases loaded. He swung at Chad Quall's first pitch and drove it into the left field stands for a grand slam, at the time only the eighteenth in Series history. Against the euphoria and hysteria, what I remember is the strange but assuring calm with which Konerko stood at the plate. Typical: focused but relaxed. He arched his body slightly and tipped back his bat before Qualls threw and then, head down, he stepped into the pitch and whipped around his bat to make solid contact. Because it was the first pitch of the at-bat, everything seemed to be over in seconds—the U.S. Cellular scoreboard and the fireworks in the night sky exploded giddily—and yet the deep-breath steadiness Konerko exhibited at the plate moments before the pitch extended time. Konerko owned that plate appearance from the on-deck circle to his curtain call. The second Konerko plate appearance I recall is far less grand, but no less characteristic. I don't remember the game or the in-game circumstances. It probably occurred during Konerko's vexed 2008 season, when he struggled with injuries and lost his stroke for long stretches. He struck out, badly missing an inside fastball he normally would turn on and drive. He stormed off to the dugout, leaning forward, his whole body a tight, inclined wall of self-directed anger and disgust, his fists clenched around his bat. If he were in a comic, there'd be a swirl of miserable black scrawls above his head. He looked miserable, and he probably was; it was a long season for him. What struck me was the rare show of emotion. After his World Series homer, he pumped both fists in the air and was cajoled by his teammates to tip his cap for the delirious crowd in Chicago. Yet after a random, despairing strikeout a few years later, in a meaningless game, his body language seemed more vivid to me. It said: I'm better than this, but the game keeps beating me. He went back to work the next inning, of course, and played out the year, reminded as all players are that baseball humbles far more often than it tickles. I noticed something in Konerko's anguished walk back to the dugout, the park (and even Hawk Harrelson) silent. It stuck with me. Anyone fortunate enough to be a daily starter in major league baseball for fifteen seasons is going to navigate that wide gulf between joy and frustration, both of which seem inexplicable and equally impossible to explain or predict. 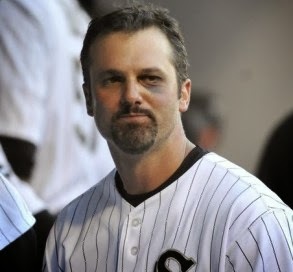 I'll miss Konerko's adult, modest, pleasing way of accepting those wide intervals. Speaking to the Chicago Tribune about his farewell year, Konerko said, "I don't want to make this into a circus with all that stuff off the field. Having said that, I want to fit in some more things. But I want to go out like I came in and (played) all the way through, where it's totally your job.… That will satisfy me the most at the end." Me too.